Rüsselsheim. Opel Mokka X, Opel Crossland X and Opel Grandland X – these are the three members of Opel’s new family of modern SUVs and crossovers. The Crossland X and the Grandland X, the newcomers with the certain X-tra, are Opel’s answer to the booming SUV segment. As they successively arrive on the market within the upcoming months, they are expected to be major contributors to the brand’s growth. Opel X-models are tailored for every taste and specific individual need. One of the bestsellers and trendsetters amongst small SUVs is the already well-known and established, robust Opel Mokka X. Elsewhere, the new Opel Crossland X and its larger brother the Opel Grandland X will add further impetus to Opel’s “7 in 17” product offensive, which will see the Rüsselsheim-based carmaker launch no less than seven vehicles this year. The X-models all play a major part and impress with an athletic design and SUV qualities. However, simultaneously each family member is unique and will appeal to its own audience, as Mark Adams, Vice President Design, explains. The Opel Mokka X was the first member of the X-range and it is a real success story for Opel with more than 750,000 orders received to date. Mokka X drivers benefit from SUV-typical raised seating position and the corresponding excellent visibility. The compact adventurer is a real eye-catcher thanks to its sporty and muscular design. Its wide stance and compact length of 4.28 meters gives the impression that it is always ready for an adventure. Therefore, it comes with the optional all-wheel system, which also helped it win two “All-wheel Drive Car of the Year” awards. “The Mokka X is really a great vehicle that blends sportiness, dynamism and robustness altogether in an aspirational package,” said Vice President Design Mark Adams. The Opel Crossland X, which has been available since the beginning of March, complements the company’s portfolio of compact all-rounders. It picks up many attributes of the Mokka X such as the robustness and elevated seating position and joins it in the SUV B-segment. “The Crossland X adds its own unique twist. The interior space on this car is fantastic and it is really targeted at people who want that enhanced functionality for their families but who do not want to compromise on style,” said Mark Adams. While the Crossland X impresses with its optional two-tone roof and cool SUV look on the outside it also delivers on the inside with ample space and versatility. Despite its length of only 4.21 meters it carries up to five people and a total trunk volume of 520 liters thanks to the sliding rear seats that can be adjusted by 150 millimeters in longitudinal direction. With the seats folded down, the trunk volume increases to 1,255 liters. With its unique blend of functionality, agility and sporty elegance the Opel Crossland X is the ideal car for both a short shopping trip and a longer journey –a compact all-rounder for families living in an urban area. The 4.48-meter long Grandland X flexes its muscles under its sporty exterior. Combined with the short body overhangs, this results in elegant proportions. The compact SUV with a maximum trunk volume of 1,652 liters can optionally be ordered with a black roof to emphasize a personal style. Under its skin the Grandland X comes with a range of innovative technologies such as the electronic traction aid “Grip Control”, adaptive cruise control with pedestrian detection and Automatic Emergency Braking, Driver Drowsiness Alert and the 360-degree camera. This combination makes the Grandland X a real challenger in the compact class. Furthermore, just like its siblings, the Grandland X offers a high level of comfort thanks to the optional AGR-certified (Aktion Gesunder Rücken e.V.) ergonomic seats for driver and front passenger along with outstanding connectivity with Opel OnStar and Apple CarPlay/Android Auto compatible IntelliLink infotainment systems. 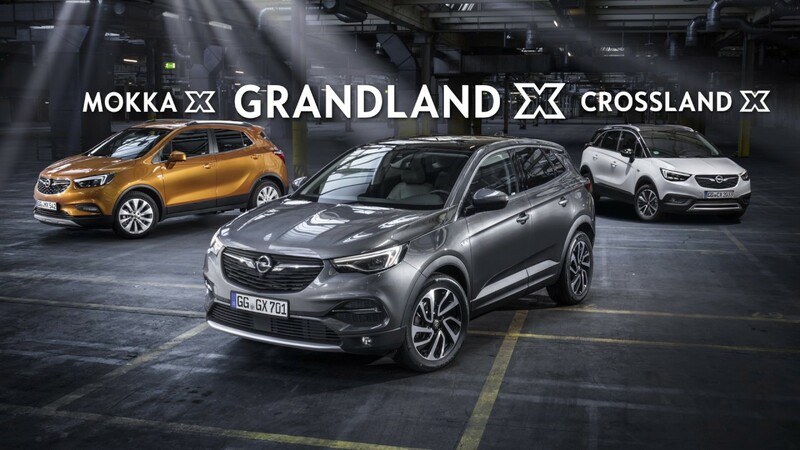 With the bestselling Mokka X and the newcomers Crossland X and Grandland X Opel offers sporty-looking and practical vehicles equipped with innovative technologies, thus meeting the various demands in the growing SUV segment. “Each of these vehicles has a clear DNA link but they all have an individual personality and a different role in our Opel portfolio,” said Adams.